FireRuth is a ready-to-use MS compatible fluorescent staining solution which was specially developed and optimized for high sensitive staining of protein spots and bands from 2DE and SDS-PAGE for subsequent protein identification analysis by mass spectrometry. Proteome Factory’s proteomics lab uses very successfully FireRuth as its standard fluorescent staining for proteomics studies, 2DE and SDS-PAGE in combination with protein identification by nanoLC-ESI-MSMS or MALDI-TOFTOF-MS.
By FireRuth proteins are detected down to low nanogram range with a linear quantification range up to microgram range (ca.3 orders of magnitude). 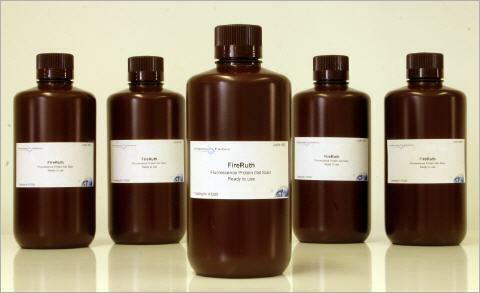 FireRuth is MS-compatible because is does not covalently modify proteins. Due to FireRuth’s compatibility to subsequent MS analysis of protein spots it is not longer necessary to prepare an additional micro-preparative Coomassie Blue stained 2DE gel for protein identification which contain a multiple amount of sample used for fluorescent staining. Weak protein spots only visible by FireRuth staining are accessible to protein identification because FireRuth is about 20-100 times more sensitive than Coomassie Blue staining methods. 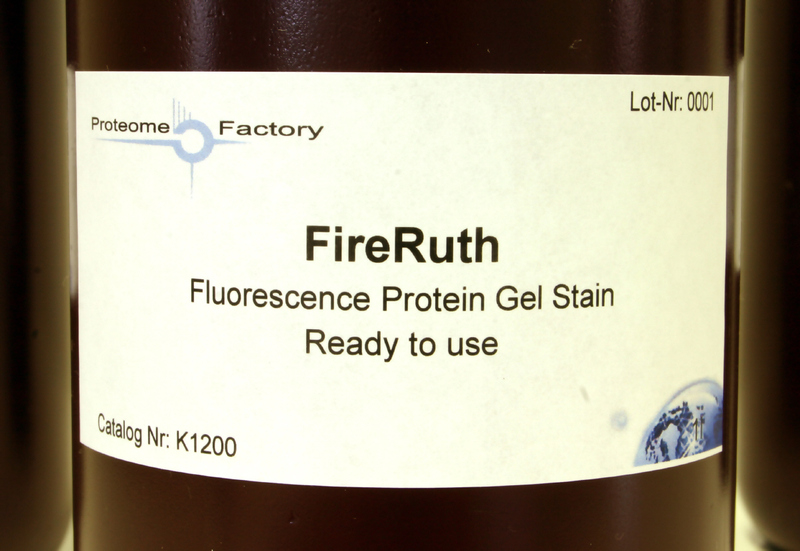 FireRuth’s application is easy and results in cost reduction and saving of time together with significantly improved sensitivity in protein identification from 2DE gels and SDS-PAGE.